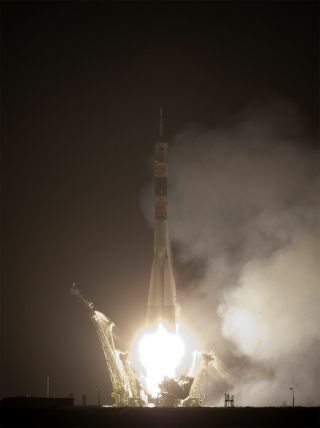 The Soyuz TMA-17 rocket launches from the Baikonur Cosmodrome in Kazakhstan on Dec. 20, 2009 carrying Expedition 22 crewmembers Timothy J. Creamer of NASA, Oleg Kotov of Russia and Soichi Noguchi of Japan to the International Space Station. This story was updated at 5:19 p.m. EST. A Russian Soyuz spacecraft soared into space Sunday carryingthree new residents for the International Space Station (ISS). NASA astronaut Timothy(T.J.) Creamer, Russian cosmonaut Oleg Kotov, and Japanese astronaut SoichiNoguchi launched on time at 4:52 p.m. EDT (2152 GMT) on the Soyuz TMA-17spacecraft from the Baikonur Cosmodrome in Kazakhstan. "Everything's fine onboard the vehicle," Kotovradioed shortly after the rocket hurtled into the sky. "Everybody feelsgreat, no problems, no issues." Kotov commanded the flight, which should catch up with theorbiting laboratory on Tuesday at 5:58 p.m. EDT (2258 GMT). The threespaceflyers are due to take up residence at the station as Expedition 22 flightengineers. Then in March 2010, Kotov will take over the helm as commander ofExpedition 23. The two spaceflyers currently onboard the space station ? NASAastronaut JeffWilliams, Expedition 22 commander, and Russian cosmonaut Maxim Suraev ? watcheda video of the launch. "Congratulations to the entire team on anothermilestone event," Williams radioed down to Mission Control. "We'relooking forward to their arrival in two short days." Kotov and Soichi are veterans in space, while Creamer ismaking his first voyage beyond Earth. Nonetheless, Creamer is not nervous, hewrote on the microblogging site Twitter, where he posts under the name "Astro_TJ." "Got a little'excited/anticipatory' now that the rocket is at the pad, but nothing close tonervous," he wrote Friday. The spaceflyers are in for apacked mission that will overlap with two visiting space shuttle flights aswell as Soyuz and unmanned spacecraft arrivals. "Really it's going to be verytense mission for us," Kotov said in a preflight news conference. "We'regoing to work with two shuttle crews, one of them bringing up the newmodule." The STS-120 flight of the shuttleEndeavour in February 2010 is slated to deliver the Tranquility module and theCupola, an observatory room that will offer a 360-degree view out of its largewindow. "Believe me, it's reallyexciting and I'm really looking forward to it," Kotov said. Kotov, Noguchi and Creamer are scheduledto stay aboard the spacestation until May 2010. "I can't think ofanybody else I'd rather be with, laughing and working together," Creamersaid. "One of the most wonderful aspects of working with this crew is thatthere's a very good sense of humor. We're very comfortable together." In between station maintenance tasks and big assembly jobslike attaching the new modules, the ISS residents will fill their time withscientific research. Kotov, a medical doctor, plans to do some medical studies. "I am going to continue my medical research," hetold SPACE.com in a preflight interview. "I have my own medical experimentprogram."